The fifth season of The Office is in stores tomorrow. 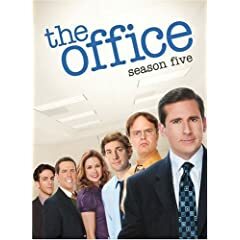 I have been following the show through its DVD releases, and have slowly warmed to it over the years (after originally unfairly comparing it to the comedic genius of the original British series). Other television releases I will be checking out are the first season of Fringe and the fourth season of Criminal Minds. Among the feature film releases I can recommend Silent Light, a movie about northern Mexico's Mennonite community. The Criterion Collection releases three classic films this week: David Mamet's Homicide, Masaki Kobayashi's The Human Condition, and Alexander Korda's That Hamilton Woman. Beef up your Blu-ray libraries this week with high definition versions of Catwoman, The Postman, Requiem for a Dream, and Creepshow (among others).